It's Friday! And a frugal Friday at that. Today has been spent crafting at work with the lovely Bailey. Keep an eye out for some pictures of our Easter crafts we made for Redo Home & Design. 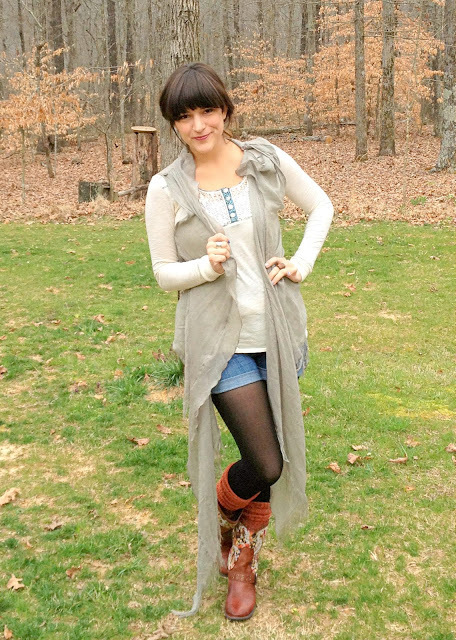 My entire outfit is made up of gifts, hand-me-downs, and bargain buys! These boots are my new favorite!I found these on sale at the Country Mall off Highway 231 when Andy & I visited Auburn earlier this week. They are somewhat western with a very Free People vibe & the embroidery colors are perfect for spring. I have been dreaming of adding some boots like these to my closet, so I was delighted to find these on sale! I went to the grocery store today & an elderly employee wearing a cowboy hat yelled at me to tell me that he liked my boots. They MUST be fabulous. Sorry the photo quality is low, I ran out of daylight. That's what I get for being a born procrastinator, I suppose.